Raven MK4 zone 2 elliptical antenna for Satellite reception in the UK. 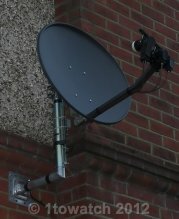 This Zone 2 satellite dish is the same dish that Sky installers use and is by far the most popular version of the Sky satellite dish. This dish is the latest MK4 type which means that it will accept MK4 type LNB's. Look at the dish feed arm to see the fitting used. MK4 LNB's are distinguishable as they have a spirit level fitted to the support bracket. No LNB is included with this kit. This zone 2 dish is suitable for use in the zone 2 transmission area of Astra 2D which is the satellite that Sky and Freesat use. The Zone 2 region is in Scotland and Northern Ireland. Many installers prefer to use this larger dish, even in Zone 1, as it will out perform the smaller Zone 1 dish especially when the weather is poor. This dish is also suitable for receiving other services such as Misspelled WordPolsat from Hotbird and the Free To Air transmissions from Astra 1. This larger dish is recommended for all areas of the UK when using non Sky services. Included in the kit is the Zone 2 elliptical antenna, all metal bracket, a packet of nuts and bolts and assembly instructions. Please note that no LNB is included. This dish is primarily intended for wall mounting using the supplied wall bracket and L pole but will also fit directly to a vertical pole up to 35mm diameter It is therefore ideal for caraveners etc. You would discard the wall bracket and L pole in this instance.